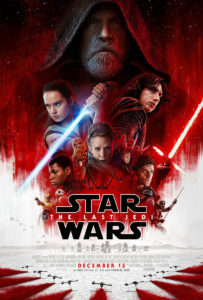 The onslaught of reviews of Star Wars: The Last Jedi have raised any number of issues with the film: it sidelines many of its characters of color in favor of trying to humanize its mass-murdering white fascist villain; it is steeped in a disturbing amount racially coded violence; its pacing is poor and one of its major plot points revolves entirely around a frustrating third-act failure to communicate. At times, it fails to follow up on the best of the promises made by The Force Awakens. Rey’s potential gets lost in the mire of fanfiction-esque Force conversations with an increasingly pathetic Kylo Ren; Finn and his new — and stunning — companion Rose are sent on a wild goose chase that, while one of the best pieces of the film, feels almost like an afterthought within the film’s structure. The Last Jedi is a good film. Second and third viewings have, for me, been enlightening in clarifying many of its motivations and its structural issues. But it cannot be viewed without considering whether or not it fails its characters of color, or remembering that Rian Johnson decreed there was no place for non-heterosexual romance within the film, and these things have left an understandably bad taste in the mouth of many viewers. 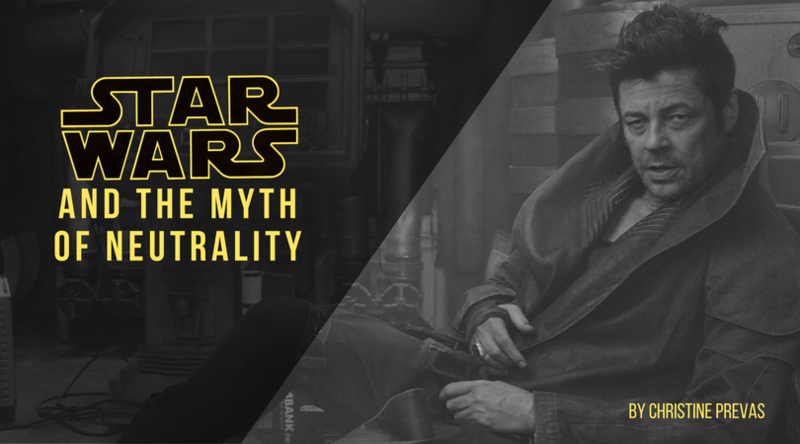 Regardless of what you think of the film, however, there is one standout thing that The Last Jedi does absolutely right: it addresses the myth of political neutrality, and it brings that myth to bear on the realities of war. Neutrality best presents itself, in The Last Jedi, in the figure of Benicio Del Toro’s code-breaking criminal, DJ. Encountered by Finn and Rose in a prison in the casino-city Canto Bight, DJ volunteers to be the solution to Finn and Rose’s cryptographic ship-hacking problem… for a price. And once he has successfully stolen a ship and rescued them from the Canto Bight’s security forces, he complicates matters for the both of them in a fascinating show of what the world looks like to someone involved with neither the First Order nor the Resistance. DJ seems to believe that his neutrality is an ideologically pure position. He engages with neither the tyrannical First Order nor the violent, anti-fascist Resistance — equal evils, in his eyes. In a political climate like ours, DJ’s resistance to declaring any support for the lesser of two evils is an aching echo of the neoliberal sensibility that anti-fascism is just as dangerous as fascism simply because it is violent. The idea that resistance must be clean, peaceful, and harmless in order to be worthwhile is not only a lie, but it is actively harmful. It prioritizes respectability over the lives of actual living, breathing, oppressed people, and it is a convenient excuse for self-preservation. And though DJ may pretend to be neutral for some greater moral reason by cloaking his explanation in this ideological discussion of good vs. bad, of both sides buying weapons and causing harm, his real motivation has nothing to do with morality. He goes where the money takes him. What’s wonderful about The Last Jedi is that it does not equivocate on DJ’s morality: he is entirely self-serving, resorting to betrayal at the first sign that he might strike a better deal with the First Order. He goes where the money is, even when the money is with the fascist war machine of the First Order. His decision upends the idea that there is something inherently noble to neutrality. DJ’s neutrality is nothing but dressed-up cynicism — if the war between good and evil never ends, why bother taking a moral stance, or standing up for anything at all? His cynicism is explicitly complicit in the tyranny of the First Order; it is because of people like him, who refuse to resist, who hide their cowardice under the guise of neutrality, who disguise their self-interest as a morally superior position, that fascism can come to power. No one, The Last Jedi tells us, can truly be neutral in times of war. While so many of us can see ourselves in the radical politics of the Resistance — Poe running headfirst into danger, Rose devastated by the number of people she sees trying to run away, Holdo’s calm, collected self-sacrifice — our world is just as readily mirrored by the characters who abstain from resistance, or who put on resistance like a costume when it is beneficial to their motivations and their self-interest. Like Kylo Ren, who pulls away from the First Order for just long enough to attempt to convince Rey to join him in starting something new, yet ultimately falls back into his relentless destruction of the Resistance, DJ’s character shows us that anyone who claims to remain neutral cannot, under any circumstance, be trusted. He shows us that not only does neutrality passively help an oppressive force by enabling it, but it actively bolsters it. Neutrality is an inherently selfish act and The Last Jedi is unequivocal: it holds no sympathy for those who attempt to justify it.